It seems like a sensible and polite question to ask a new patient on the phone or a patient standing in front of you at the desk after seeing the dentist. Now it’s fabulous if the answer is yes but what if the answer is no? 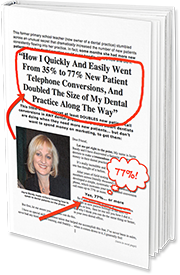 The caller now hangs up the phone or the patient walks out of the Dental Office with no appointment to solve and treat their dental problem. I am always baffled why we ask this question. Your Front Office Team have a duty of care and responsibility to make the patient’s next appointment. Too often this thought never crosses their minds. The problem now is what do you say or ask a patient so they do go ahead and make their next appointment and don’t say no? I am a firm believer that the best way to ensure a new patient makes an appointment on the phone is to make the appointment with them. Presume the patient is now ready to make their next appointment. Most of the time they are ready but we then ask them if they would like to make an appointment and it is easier for them to say no. Guide them and help them make the appointment. The patient is still given choices but you have removed the choice of whether they will make an appointment or not. After speaking with a person on the phone you know they need an appointment. After listening to the Dentist explain to the patient why they need treatment you know they need an appointment. When a patient leaves your office with no appointment or hangs up the phone with no appointment you have really let that patient down. “Thinking about” treatment is never the answer to their dental problem. So stay focused on making an appointment and you will make the appointment.